Hong Kong SAR is Not a Democracy! Could anybody out there give me a quick introduction to the Hong Kong government and its political landscape? I’ve always had the impression it had a democracy and there are like dozens of political parties in the city. Hong Kong is a semi-autonomous city that is a Special Administrative Region (SAR) within China under the Basic Law (HK’s mini-constitution). In essence, Hong Kong SAR is semi-democratic since it does not have universal suffrage, a basic tenet of a democracy. The Chief Executive, currently CY Leung, is the head of the government in Hong Kong SAR and is answerable directly to Beijing. However, because so many of the functional constituency parties are instructed by Beijing for whom to vote, the outcome was already known regardless of televised debates and campaigning. Hong Kong also has a unicameral legislature popularly called the LegCo, or Legislative Council. 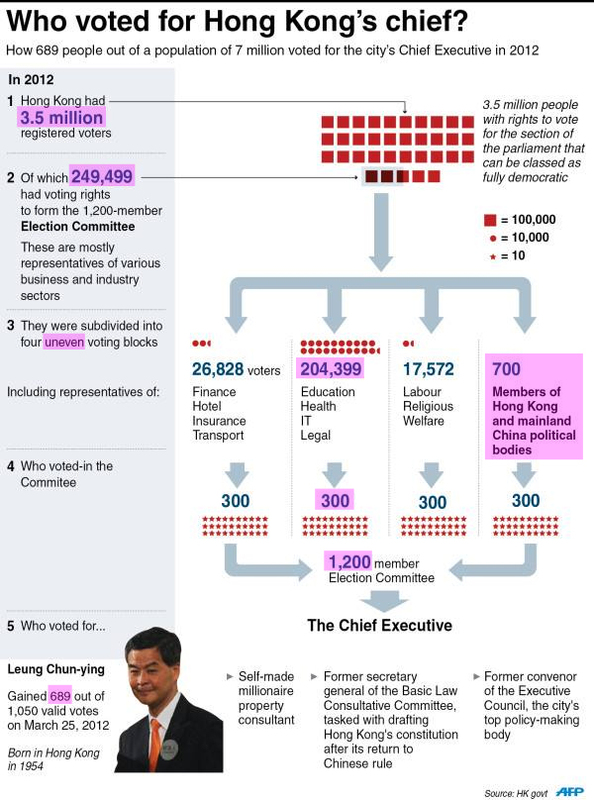 The LegCo consists of 70 elected members with a fixed 4-year term. Lawmakers in the LegCo, are either elected by direct elections for the 35 seats representing geographical constituencies (districts) or by functional constituencies representing professional or special interest groups (numbering around 230000) for the other 35 seats in the 70-seat LegCo. The major functions of the LegCo are to enact, amend or repeal laws, check and approve budgets, approve taxation and public expenditure, and review the work of the government. Due to the design of the Legislative Council, the majority of elected officials tend to be from pro-Beijing political parties or groupings, which often work together for corporate-government interests. Pro-Beijing coalition: political parties united by the political ideology of being closer to Beijing government, but differ on other issues. Since the handover, the Pro-Beijing camp have never lost being the majority in the LegCo, thanks to support from functional constituents and collaboration among the Pro-Beijing parties. Notable parties include the DAB (Democratic Alliance for the Betterment and Progress of Hong Kong), Liberal Party, and FTU (Federation of Trade Unions). Pan-Democrats: political parties united by calls for democratic reform, universal suffrage and human rights. Pan-Democrats are often labelled an “opposition camp” by various groups and media aligned with the mainland Chinese government, since the Pan-Democrats goal run counter to values promoted by the Chinese Communist Party. Recently, 27 democratic legislators formed the Alliance for True Democracy, a formal coalition to show solidarity for genuine democracy. Notable parties include the Democratic Party, Civic Party, and People Power.